The Senate Environment and Public Works Committee has scheduled a vote on the nomination of Gina McCarthy to be Administrator of the Environmental Protection Agency for the morning of Thursday, 9th May. All the Democrats on the committee will vote for McCarthy. Since they hold a ten to eight majority over Republicans, it is certain that the committee will send the nomination to the Senate floor for a confirmation vote. What is less certain is whether Senator David Vitter (R-La), ranking Republican on the committee, will have the committee’s seven other Republicans with him in voting against McCarthy. If he does, then the next question is whether Vitter will lead an effort to block a floor vote. It takes 60 votes to invoke cloture to end debate and move to a vote. So Vitter needs to round up 41 votes to block McCarthy’s confirmation. There are 45 Republicans in the Senate. If Vitter leads the effort against McCarthy, it is likely that he will have two or three Democrats with him. But there are also a number of Republicans who might defect. Several of them don’t like McCarthy, but believe that deference should be given to the President’s nominees unless they are manifestly unqualified or corrupt. The argument for blocking McCarthy’s confirmation is simply that it is one of the very few shots that Senators will have during the 113th Congress to push back the EPA’s ongoing regulatory onslaught against affordable energy. 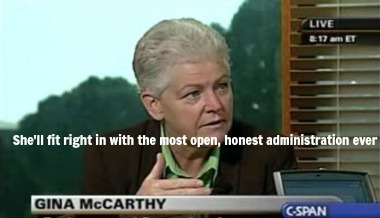 McCarthy, as Assistant Administrator for Air and Radiation for the past four years, has been in charge of writing and promulgating the several Clean Air Act regulations that are designed to close coal-fired power plants. In my view, those Senators who oppose the EPA’s agenda should not be voting to promote the point person for implementing that agenda. She also misled both the Congress and the public about the design and impact of two of the most expensive regulations—new fuel economy targets and the Carbon Pollution Standard. My colleagues Marlo Lewis and Anthony Ward explain her duplicity here.